Coastal bookshelf decorating can be fun wherever you live and it doesn’t need to be on the coast. There are few things that look prettier in a room than a well-placed bookshelf. Something about a bookshelf lends personality to a room. 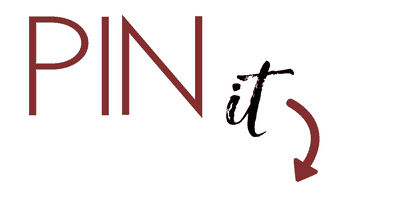 In it, you can display a variety of curiosities and items picked up along the way when traveling and collecting. People coming into your rooms will get a chance to let their eyes play with the various textures and colors, and it gives your room a pop that you might not get from anything else. When you’re looking to fill your bookshelf, you may decide not to opt for books at all. Why? Because sometimes the styling of the room doesn’t require them, or because it is a room where there is no need for books. 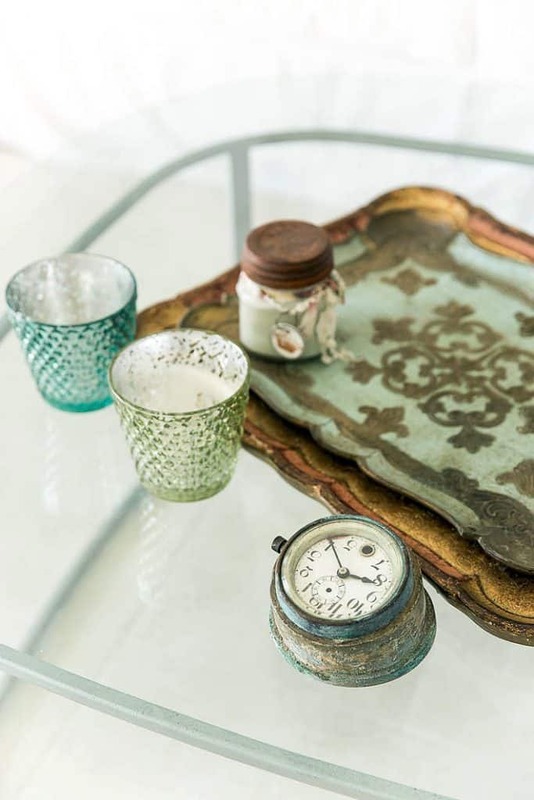 If you’re an avid reader, you’ll know that the vast majority of the time books don’t have any particular color scheme or sizing that is standard, so while reading is fundamental when it comes to the fundamentals of decorating, incorporating your books might not be appropriate for the room of interest. Knowing that we can use our bookshelves for decorative purposes without being limited to books at all! For our particular project, we are going to focus on coastal bookshelf decorating. 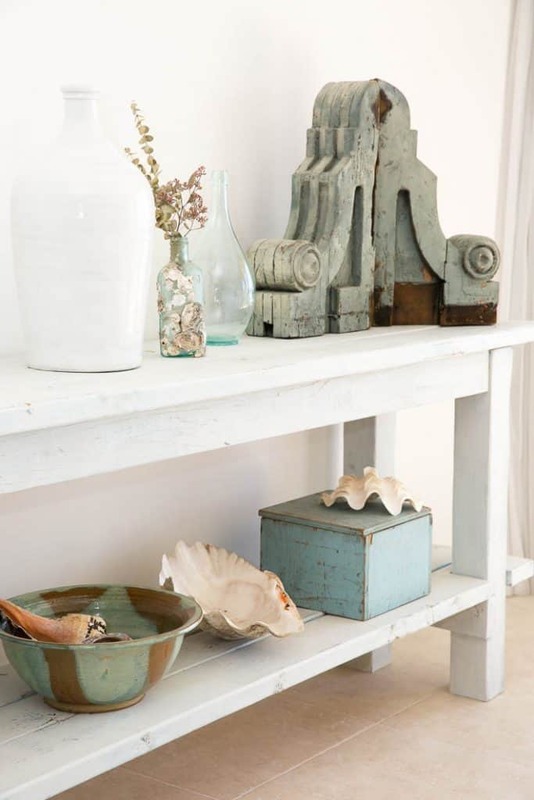 There is so much to explore when you’re working with coastal themes, from beautiful shells to bird feathers, to boat elements. 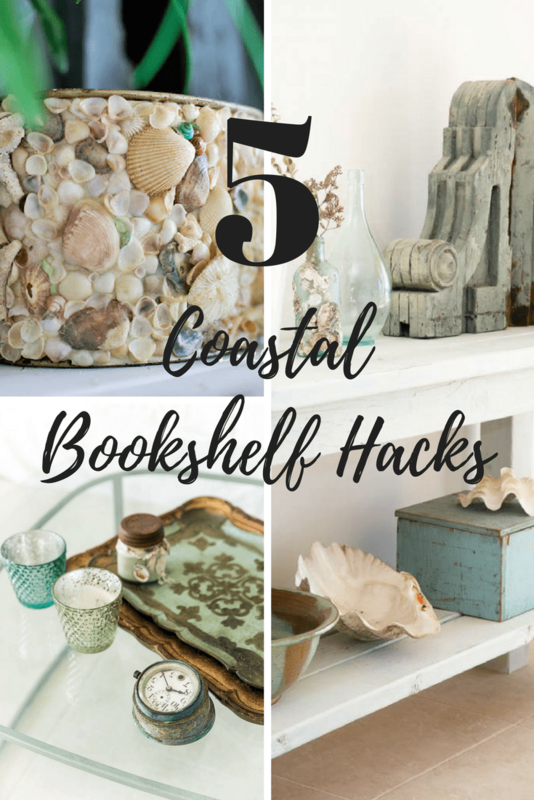 Here are a few great hacks for decorating your coastal themed bookshelf without books. Whenever you think about the coast, glassware probably comes to mind. After all, who can forget the first time they saw a ship in a glass bottle and wondered about how they could possibly have fit the model into the bottle at all? 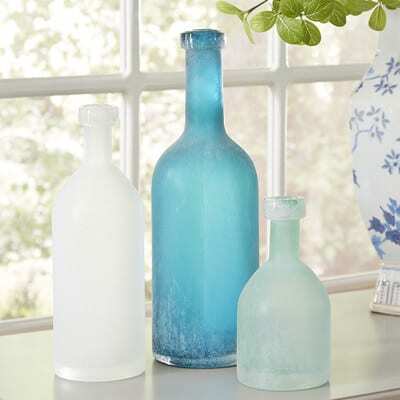 Find a beautiful bottle, with green or blue tones, to evoke the mysteries of the sea. 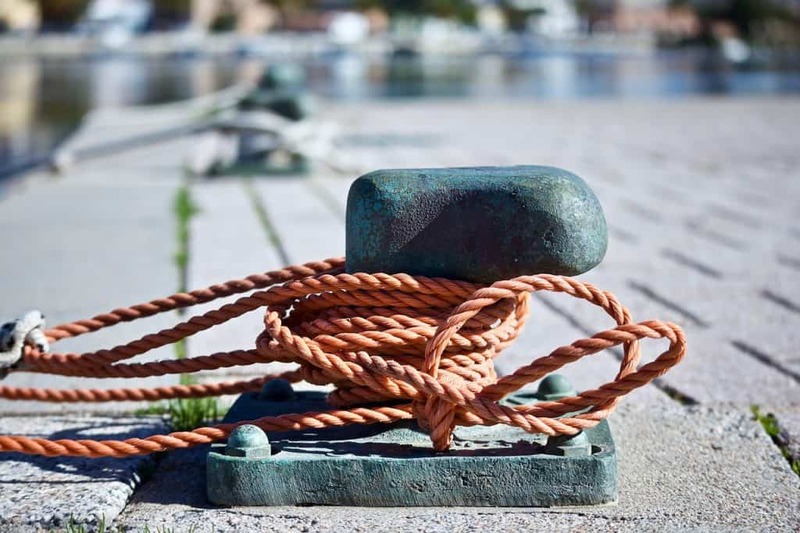 If you’re really looking to stick with your coastal theme, don’t be afraid to find a great thick length of rope and rigging. Seeing the rope will bring to mind the knots, and rigging necessary to sailors at sea. Rope lends an air of authenticity to your coastal bookshelf, and will give you a beautiful neutral to balance out your cool colors. Rope decor is often seen in Coastal Living Magazine, a favorite source of mine for inspired beach ideas. What would any coastal theme be without the beautiful shells and coral that come directly from the water? When choosing your shells, you’ll have a variety to choose from; bleached whites, pretty colored corals, and unusual looking sea sponges. Hopefully, some of the shells you encounter on the beach yourself will be on display or made into a craft. 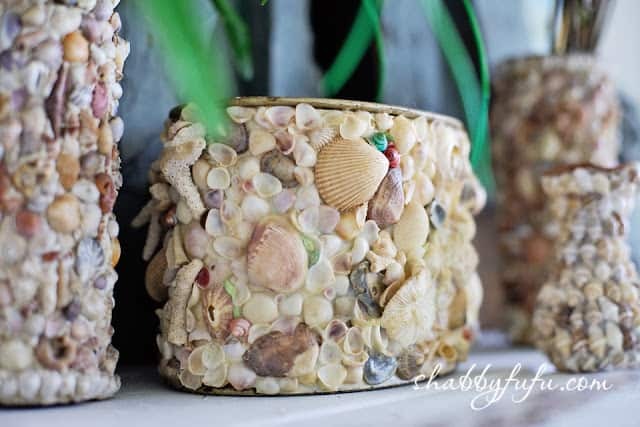 You can use sea shells to decorate TABLESCAPES with a coastal theme too. 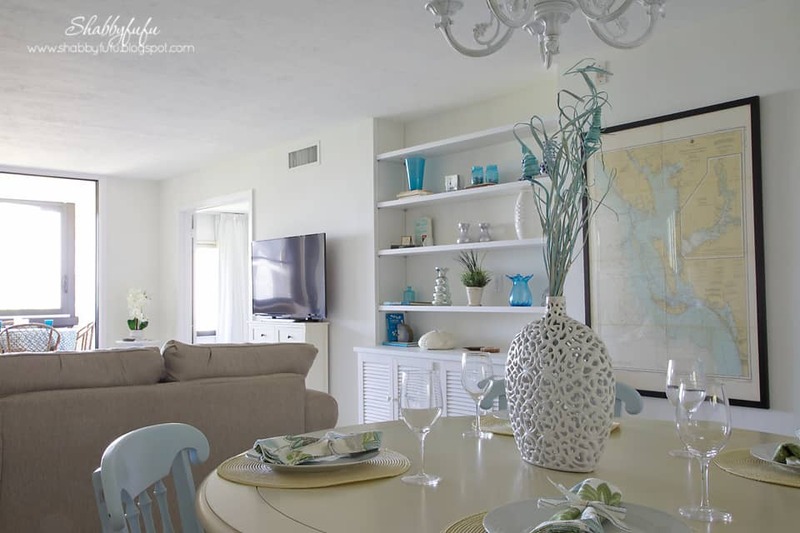 A pretty bowl of sea glass or glass floats could be just the thing to add a pop of color and conversation to your coastal bookshelf. 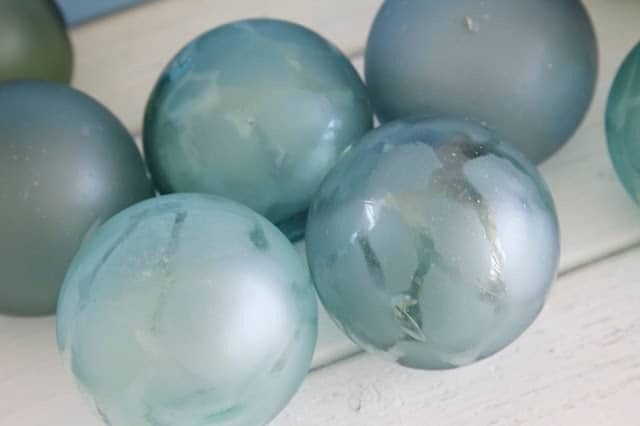 Sea glass is old pieces of glass that have been worn and weathered by sand and salt water, and wash up on shore. Glass floats are not as common to find anymore, but you can buy reproductions. These pieces are cloudy and opaque, and they leave the person looking at them to wonder where the glass could have come from or to whom it belonged before it began its long journey to your bookshelf. One of the first things you think of when you see anything coastal themed is travel, and the ability to see the world. What better way to convey those feelings than a globe or a map? You can mix it up with a framed map of your favorite beach, or an old globe from a thrift shop with countries whose names and borders have changed from our present-day boundaries. Coastal bookshelf decorating can be fun, with your shelves suggesting a story of adventure and beauty out on the high seas. No books necessary! Janet, I’m sorry. I hope wonderful memories will bring you comfort and peace.